Every now and then, we read a book and find ourselves cruelly aware of the fact that we simply cannot read everything out there. We do enjoy other life sustaining habits such as eating, sleeping, spending time with friends and occasionally watching a TV show or going to the movies. And yet that in no way stymies our frustration when realizing we’ve just picked up a book that is in fact the latest of a series that, up until now, we knew nothing about. Often times, if there is no appeal attached to the subject matter, we’ll put the title aside and simply move on to the next book. 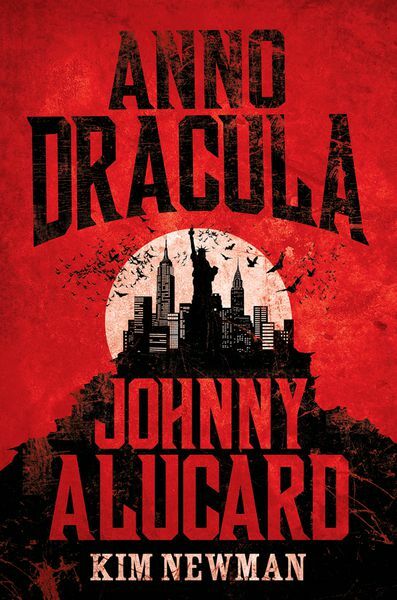 Whereas we have always been fascinated with the fictional character of Dracula and several colleagues recommended these books in the past, we opted to simply jump in and see what’s what. The basic foundation for the series is that Dracula actually existed and Bram Stoker wrote a highly fictionalized book about him. In the end, the Master of the Undead became a political force and brought about an acceptance of vampires to the living people of the world. This particular entry gets rolling in the mid 1950s where movie making genius Francis Coppolla is in Romania to film his own “Dracula” starring Marlo Brando. Cameos by well known personages abound in this tale and one soon begins to understand just how interwoven modern culture is to Newman’s saga. He totally skewers many of our superficial mores with deadly accuracy. One of Coppolla’s technical staff is Katherine Reed, a vampire elder, who is a philosophical obersever of all things living and dead. During the course of the shoot, she encounters and befriends an orphan vampire lad unaware that he carries within him the true essence of Dracula. Through her intervention, the boy is hired as one of the director’s assistant and ultimately returns to American with the film crew when their work is completed. Once in the states, the boy continues to mature and assumes the persona of one Johnny Pop, a hip-cat socialite who befriends the then King of New York, Andy Warhol. Pop’s ultimate scheme is to create a powerful new addictive drug made from vampire blood and through his new connections among the city’s elite, spread it to millions. He does so with the skill of a surgeon and then moves on to Hollywood where his true goal is revealed. Via the movie industry, he iniates a global rock concert to be held in Transylvania where he will at long last allow the Dracula part of his being to be revealed on the world stage and inuagarate the beginning of a new age of Vampirsm. Along the way, the Prince of Cats, encounters old foes. Chief among these are Katherine Reed, Genevieve Dieudorme and Penelope Churhward. If one if familiar with Stoker’s original novel, they easily come across as Dracula’s Brides. He also makes some truly bizarre and horrific allies. The novel, happily for its size, moves along at a good pace and has it share of powerful action sequences. In the end, we found the book exceptional and may just have to start digging up some of those earlier chapters. 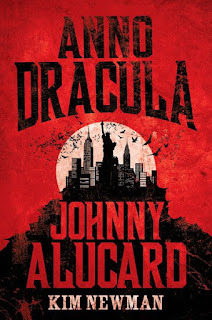 “Anno Dracula – Johnny Alucard” is really a whole lot of blood-curdling fun.